Pine and Bamboo, Cannon Hill, Brisbane - my name is Food. 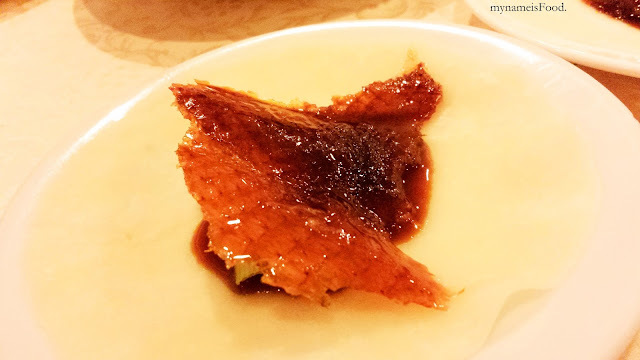 Pine and Bamboo, a restaurant located East of the CBD known most for their famous Peking Duck and yes, I would have to agree that so far, that this is one of the best I have eaten in Brisbane. They don't only serve Peking Duck of course, they also serve other Chinese dishes like other Chinese restaurants would. Their space is quite big so whether it may be a family gathering or a birthday party, it can cater for any. 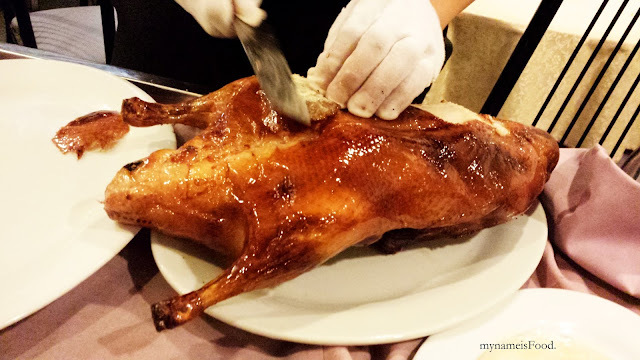 As you order the Peking Duck, it does take quite a while for it to be ready. 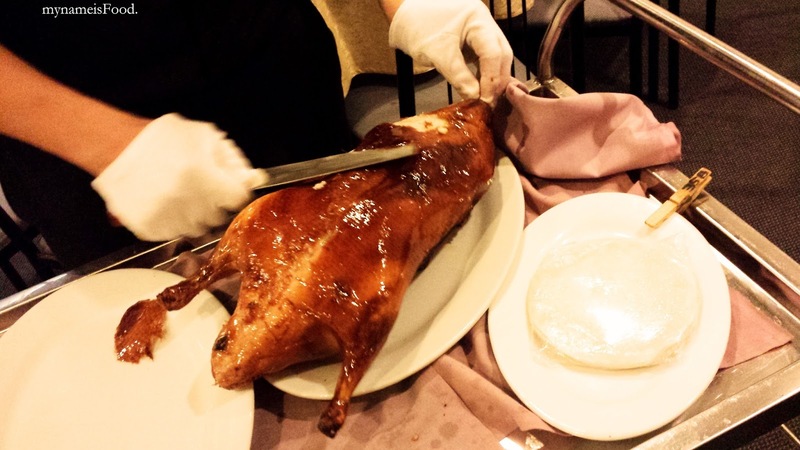 When it is ready, the Peking Duck is sliced in front of you and the skin is carved thinly, fat-free and oh so crispy it was when they were carved and placed on a big plate. They carve as much as they can out of the whole duck and the duck meat is served as any way you like it, either in two course or three course meal in which we chose the two course meal since it would be enough for the two of us. You are able to choose between a Fried noodles with Duck or San Choy Bow (duck diced into little pieced stir fried with vegetables and placed in cabbage cups). 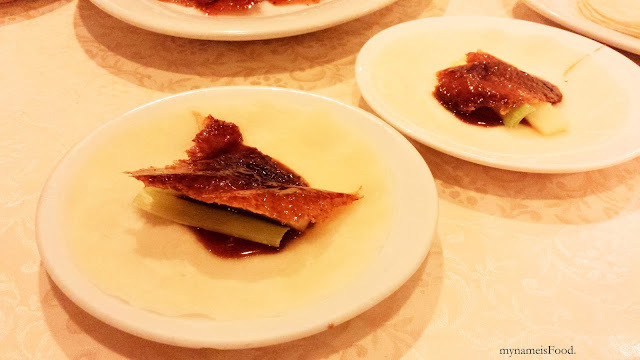 You are given slices of cucumber and spring onions, hoi sin sauce in a small bowl and of course, the peking duck wraps. You are able to get more wraps for extra bucks if you want to. 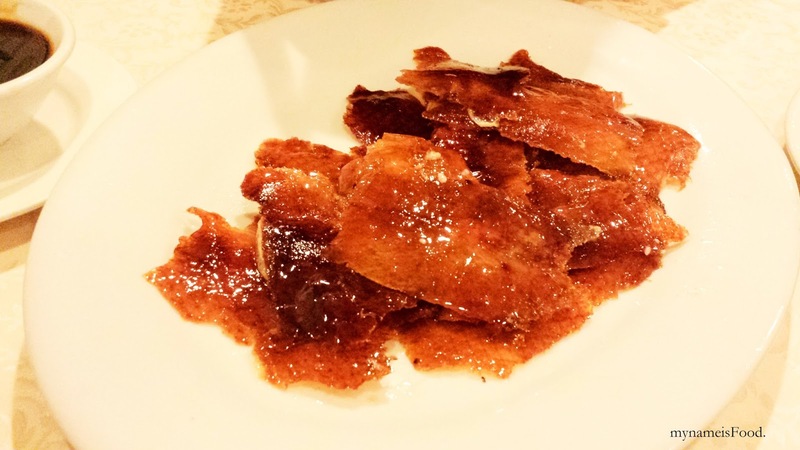 Crispy Peking Duck Skin sliced perfectly with no fat or duck meat attached to it. 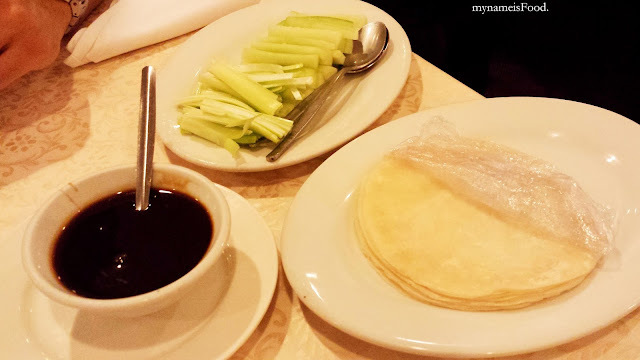 The waiter who carves the Peking Duck would prepare the Peking Duck wrap for each of us at first leaving us to do the rest of the wraps ourselves. The right way to do it, well I don't actually think there is the right way, or let's just call it the traditional way. 5. Wrap it and eat. Some may not want to add the spring onions or the cucumber, while some of us likes to eat with double crispy peking duck skin... sneaky sneaky.. 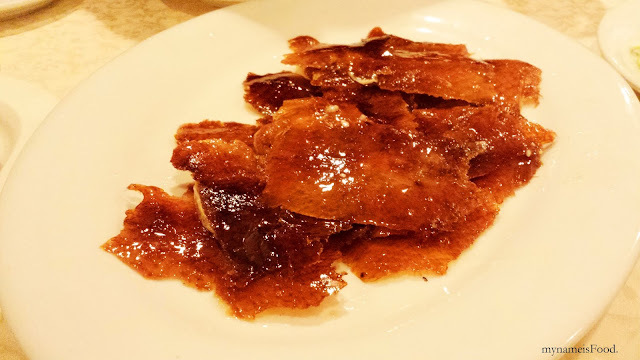 Although sometimes you may end up wanting more crispy peking duck skin, remember, too much is never good for the body though it may be yummy at the start, but the more you eat it, you may feel it gets a bit too much. If you would like to try or have never tried, I do suggest you come visit here yourself, get their Peking Duck and be mind blown on how good such a simple dish can be. As for the second course option the the Duck Noodles or the San Choy Bow, I would recommend the San Choy Bow since I felt that it was a lighter version, also the sauce and texture was just right, it wasn't too filling in the end which was nice. However, the Duck Noodles were delicious too, but I felt that sometimes the noodles were oily and not alot of the duck meat was used. However, either are good options for you to try and you can even get both if you wanted to for extra.